I don't know if this helps. BTW, the late style V11 regulator is sourced from Shindengen, I happened to see this in my manual today. Riding with a voltmeter connected to the battery, at highway speeds voltage fluctuates between 14.03 to 14.33 volts. This is with the SH775. Ahh, don't tell the manufacturers of Variable speed drives that MOSFETs aren't switchable, they do it all the time at about 20 KHz, before that they used to switch SCRs by reducing the current to zero so they turned off. Having said that I do agree the manufacturers of simple Voltage regulators probably don't spend too much on the hardware. I was an apprentice when the first SCR based variable speed drives came out and I've taken a keen interest in the technology ever since. Before I got into Guzzi the majority of modern motorcycle regulators were shunt type 3 phase units with SCRs to shunt out the coils, I imagine they have been replaced by MOSFETs or something else by now. Just looking at the Ta to Io curve above and have to say that this regulator cannot tolerate more than continuous 10A at ambient temperatures it is typically exposed to. Although I did not actually measure, I think I can safely assume that the ambient temperature V11's regulator is exposed to is at least in the range of 60-80°C. 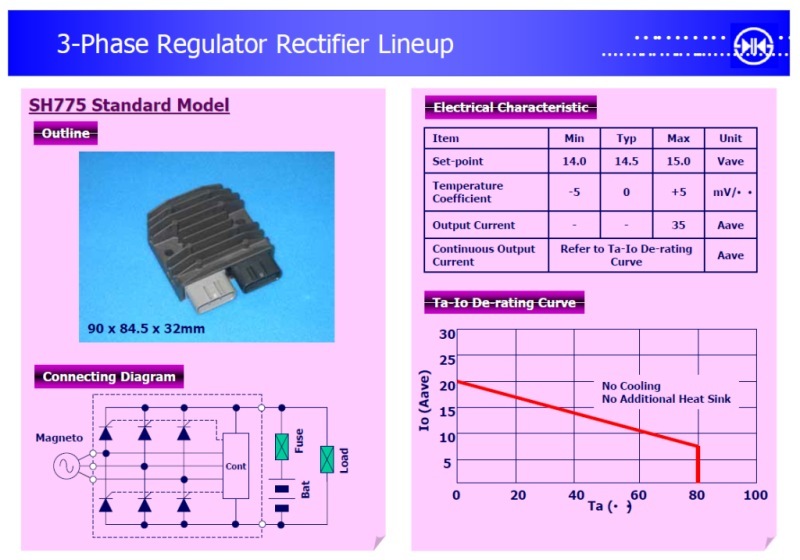 35A seems to be what rectifiers can handle for a short period of time. Although, it is a bit unclear what "No additional heat sink" means. Is it a heatsink in addition to the already existing one, or is the data for the semiconductors only? One way or the other, the thing is not designed to operate at >80°C. Although I did not actually measure, I think I can safely assume that the ambient temperature V11's regulator is exposed to is at least in the range of 60-80°C. I guess I don't understand why the regulator would be exposed to temperatures that high. In the stock position, which I didn't use, it looks to me like the air hitting the regulator would be about the same as ambient outdoor temperature. Stock position is behind oil cooler and between cylinder heads. At least on Le Mans.Nice and cozy, I'd say. Anyway, even at 30°C the thing is rated 15A. However, it could well be that the info is simply caca del toro printed on the box in order to make the product look, er... "professional" (lacking better word). My stock regulator was under the oil cooler, not so much behind. And even though the heads and exhaust are not far away, it seems once the bike is moving more than a few mph the airflow will sweep all the heat to the rear. I guess we can agree to disagree. Also, I will let everyone know as soon as it burns up! It's been doing ok so far here in 100 degree weather. Corey, any updates? I’d really like to try one of these. The season is over up here, and the Corsa took the last trip home In the van. Lost tach and a few miles later died. Charged the battery, and started right up, all well, just not charging. Seems to me SH775rr regulator would be a better choice ? Anybody with experience In this matter ? More reading,,, and IPA time. No charging + no tachometer could = 2nd ("Headlight") Relay. You have headlights, brake light? What does the voltmeter say? ….This is not a cry for help. Superbike in Argentina right now,,,,, but into the garage #2 Omron out, all the Connectors from Down under,, all metal same hight. This is just a minor detail,, I have plenty of time to sort it out. Just a little curious about a better regulator. And again she sure looks good on the w bench, positive yes, why not. If it was in may,,, different story. Meaning not ordering parts tomorrow, will follow this tread. Curious again, Docc, same cylinders With Your mileage ? After the bike stalled,, took about 2hours to get her home, battery had recoverd a little,, actually trying to start,( noticed headlamp on the garage door ) inside garage checking V, 11.73.